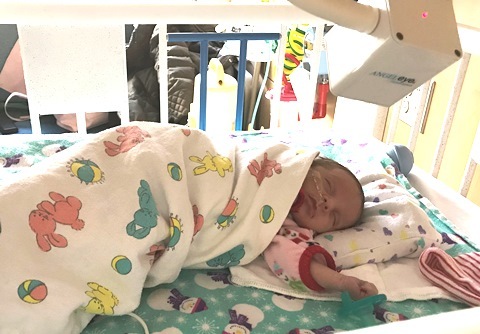 Babies who are born too early or with complications may spend time in Overlake Medical Center's neonatal intensive care unit (NICU) before going home. That stay is a little easier, thanks to "Angel Eye," a secure webcam that allows parents and those they approve to view their babies via a secure connection. Overlake is the first in our area to offer the device, with a camera available for every NICU baby. “I have my twins here, Jackson and Charlie, and they were born at 33 weeks. So they came a lot earlier than expected,” said Ashley Pose, a new mother of twins. Ashley's newborns are at Overlake, where the staff provides 24/7 care throughout the year. “We are blessed that they are healthy and everything came out great with them, and all they need to do is work on their feeding,” said Ashley. The camera system allows parents to log in from anywhere in the world and see their baby whenever they want, explained Sarah Metroka, an Overlake internet system analyst. “When I'm up during the night, I'll log in and check in and see them, usually they're just kind of hanging there and sleeping, but it's nice," said Ashley. "You get a feeling of relief just to be able to check in that way." “I have family in Argentina, and they're able to text me and say, 'Oh Charlie is sucking her thumb or Jackson's very alert he's looking around,' and that's cool,” Ashley said. See the KING5 News story or the Q13 Fox story featuring Overlake's Angel Eyes.